ataract is the clouding of the natural crystalline lens and typically occurs because of ageing, although other reasons may be prolonged use of steroids, exposure to ultra violet and associated health problems like diabetes and eye injuries. Cataract refers to the clouding of the natural lens of the eye. The lens of the eye is similar to the lens of a camera and is responsible for making a sharp image on the retina (light sensitive part at the back of the eye). Travcure Medical Tourism provides economical, yet high quality options for Cataract with phaco with ALCON Implant surgery in India. We are associated with the best ophthalmology and eye care hospitals and surgeons and hence provide the most successful and affordable options for surgery. Cataract is the most common cause of blindness worldwide. 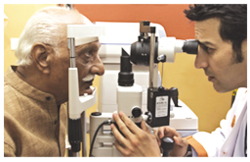 It is fully correctable with complete recovery of vision on treatment in large majority of patients. Multifocal lens implantation is performed at our centre for patients who are above the age of 40 years and want the correction for near as well as distant vision. It is performed by implanting multifocal IOL after performing cataract surgery. It is also suggested for young patients who are not fit candidate for LVC / ICL implantation. To see more videos on Paediatric Ophthalmology surgeries, click here... Paediatric Cataract Surgery is a complex issue best left to surgeons familiar with its long-term complications and lengthy follow-up. Treatment is often difficult and tedious and requires a dedicated team effort. The human eye has a natural lens, which is normally transparent and helps to focus the light on the retina and thus form a clear image. When this lens becomes cloudy, usually due to aging, it is called Cataract or Safed Motiya. This obstructs the light and causes vision to become hazy. Apart from senile cataract, there are other types. Secondary cataract is due to an eye surgery, diabetes, use of steroids etc. Traumatic cataract follows an eye injury, sometimes many years later. Congenital cataract occurs often in both the eyes and may be due to metabolic diseases, consanguinity, viral infections etc. A cataract is a progressive painless clouding of the lens inside the eye which leads to a decrease in vision, double vision, glare or halos around light. Cataracts are the number one cause of blindness worldwide because many places do not have good access to modern care and technology. Cataract is a clouding or opacity of the lens in the eyes that leads to a gradual loss of vision. It is one of the leading causes of blindness throughout the world especially in elderly people. In the asian sub-continent, millions of people are affected by cataract. More than 60% of those over 65 years of age and 90% of those over age of 85 have opacities of the lens. Cataract is clouding of the normally transparent lens of the eye.With the increase in opacity of the lens, the light rays are prevented from focusing on retina, leading to blurring of vision.